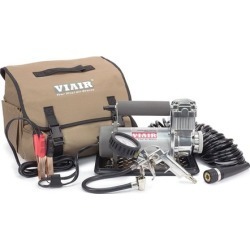 Viair's 45040 450C Air Compressor Kit is built around their 450C model air compressor. 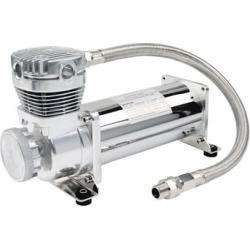 A continuous duty cycle compressor rated at 150 PSI, the 450C provides the powerful foundation that users need to build out their air compression systems and utilize the pneumatic tools they want. The 450C features fast fill rates suitable for 2.5 and 5.0 gallon tanks, an oil-less, no maintenance design, with a gearless direct drive permanent magnetic motor, heavy duty PTFE piston ring and precision and high speed durable bearings for increased piston and motor life. 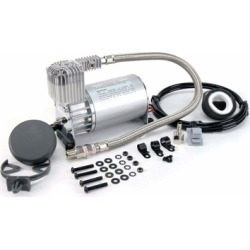 Additional parts provided with the kit include: mounting hardware, heavy duty mounting feet with vibration isolators, freeze-resistant wiring, remote mount air filter assembly, air line for remote mounting air filter, heavy duty terminals (spade connector, ring terminal) and more. 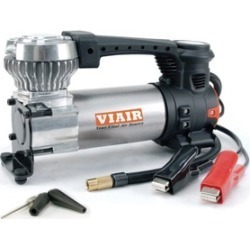 The VIAIR 450C compressor is used at the center of a fully functional onboard air system and is rated to 150 PSI maximum working pressure with 100% duty cycle, meaning that the unit is able to be operated constantly in a 100 PSI, 72° Fahrenheit environment. 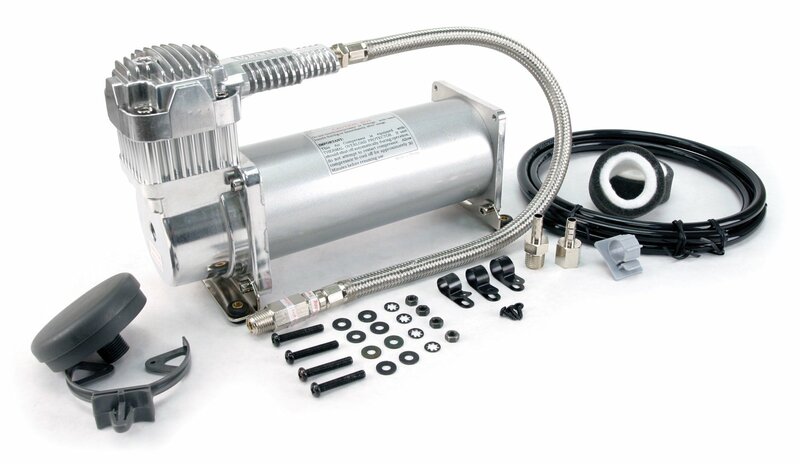 Features include a standard ¼" NPT stainless steel braided leader hose with inline check valve and insulated wiring for simple installation. Continuous duty cycle compression at 150 PSI. Configurable for different uses, and easy to add system components. Compressor duty cycle refers to amount of time a compressor can be operated in a given time period, at 100 PSI and at a standard ambient temperature of 72°F. Duty Cycle is commonly expressed in percentile as: compressor on time (compressor on time + off time) %. As an example, a compressor that is rated for 25% duty cycle means that compressor can be operated at: 100 PSI @ 72°F for 10 minutes on and 30 minutes off. 10 min. on / (10 min. on + 30 Min. off) = 10 min. / 40 Min = 25% duty cycle. VIAIR 450C air compressor, mounting hardware (nuts, bolts, washers, locking washers), heavy duty mounting feet with vibration isolators, freeze-resistant wiring, remote mount air filter assembly (two spare elements), air line for remote mounting air filter, remote mount air filter fittings (2), heavy duty terminals (spade connector, ring terminal), check valve pre-installed in stainless steel braided leader hose, owner's manual.